Late last year I attended The Big Design Market in Melbourne, where many independent artists gather together to share and sell their creative works. I went hoping to find some creative inspiration and boy did it hit me right in the face! As I was moseying around the stores, something above caught my eye, I looked up to find what only can be described as the most beautiful awe inspiring installation of stars, hanging like a chandelier from the ceiling of the Melbourne Exhibition Centre. I was so captivated by the beauty of it, I couldn’t help but just stand and marvel at it’s magnificence. Whilst contemplating how in the world one could create such an intricate masterpiece. The mass of stars indicated that this art piece had been an incredibly time consuming job, requiring many helping hands. 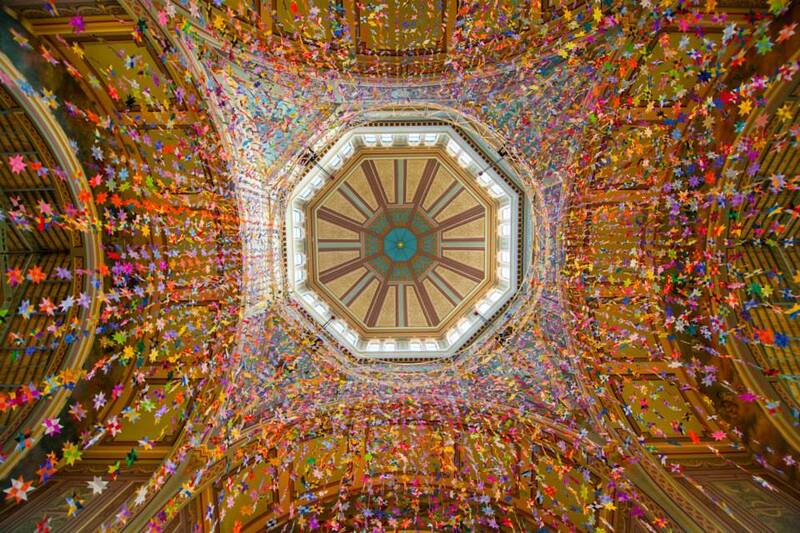 Being a Visual Merchandiser, naturally I wanted to know the story and the processes behind the whole installation so I set out to hunt down the creative genius behind this installation. Her name was Maryann Talia Pau, and what an remarkable story she had to tell. Maryann is a weaver. She says weaving is what she was born to do. And I couldn’t agree more. 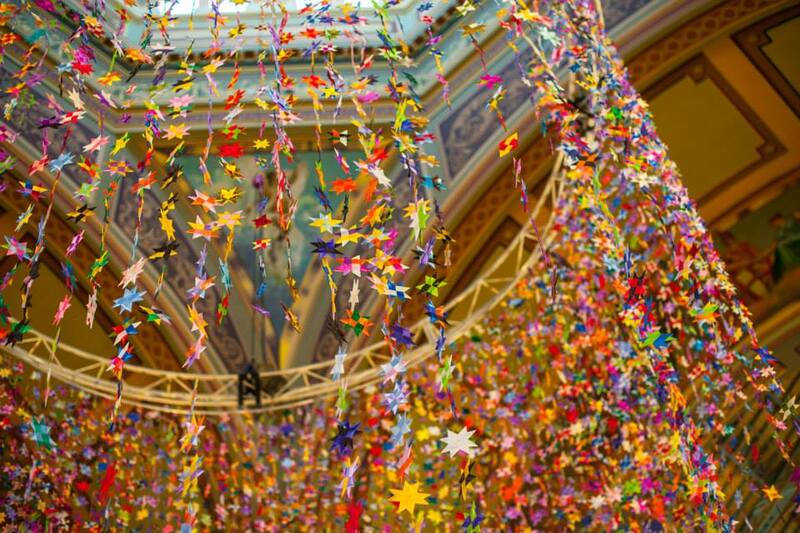 This project, the ‘1 Million Stars to End Violence’ came into being as a result of the Jill Meagher murder. A woman who was raped and killed one night in the streets of Brunswick, Melbourne. Her death impacted many Australians and Maryanne was at the receiving end of many peoples letters and tributes where she worked as a volunteer at the local Brunswick Baptist Church. Amongst the many condolences, a quote from Martin Luther King Jr made it’s way into Maryanne’s hands. This quote had such an impact on Maryann that she responded in the only way she new how. 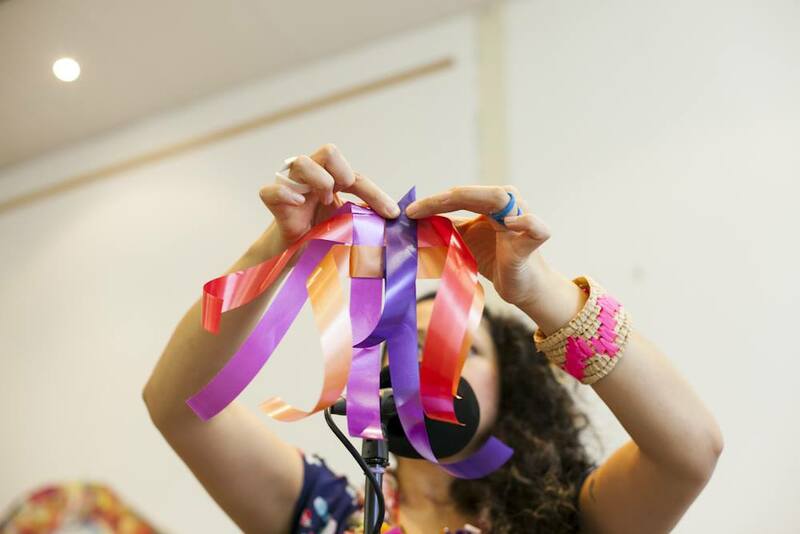 She starting weaving stars out of ribbon as a stand against violence. And before she knew it, everyone wanted to help weave these stars as a symbol of their support. The overwhelming support resulted in Maryanne running star weaving workshops in her local shop on Brunswick street. In these workshops she taught people how to make 8‐pointed stars out of ribbon. It was then and there that she made it her goal to make 1 Million Stars worldwide by 2018 to help put an end violence. 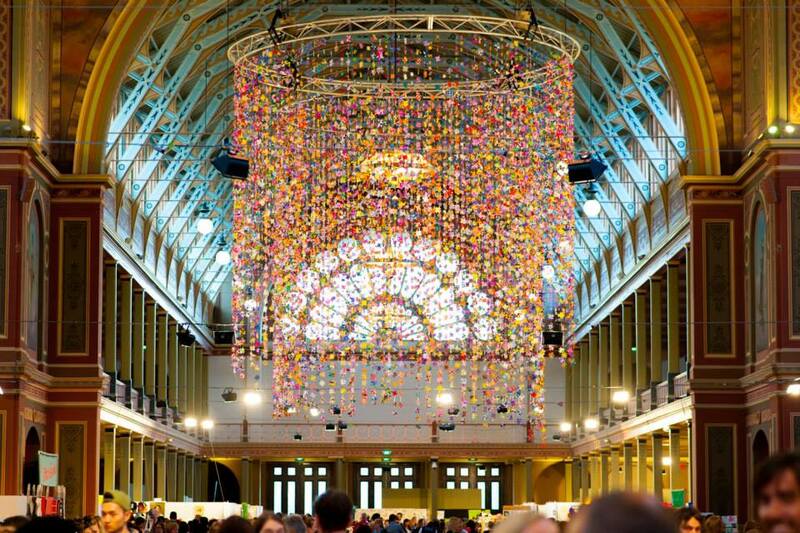 With the Big Design Market being her first installation of 11,000 stars. Upon hearing Maryann’s story, it completely blew me away that from that one little act of weaving stars birthed what has now set it’s self up to become a worldwide project. To think that such a simple idea could bring an entire community together in unity, let alone nations of the world. This was such an eye opening encouragement to me that all it can take is one small but great idea to impact a multitude. Maryann’s story has influenced me to pay more attention and take more time with the small ideas rather than just overlooking them. It has also inspired me to take action on the small ideas because you never know where they could lead you. In saying this, I am now collaborating with Maryann and bringing my very own spin to the ‘1 Million Stars to End Violence’ project, in a retail environment. This venture came about of my own initiative and is a collaboration with Myer and the cause 1 Million Stars to End Violence. This campaign is about raising awareness of violence against women in particular, in the lead up to International Women’s Day 2015. Myer Melbourne will be holding star weaving workshops, 5 days a week, from January 15th — February 21st. 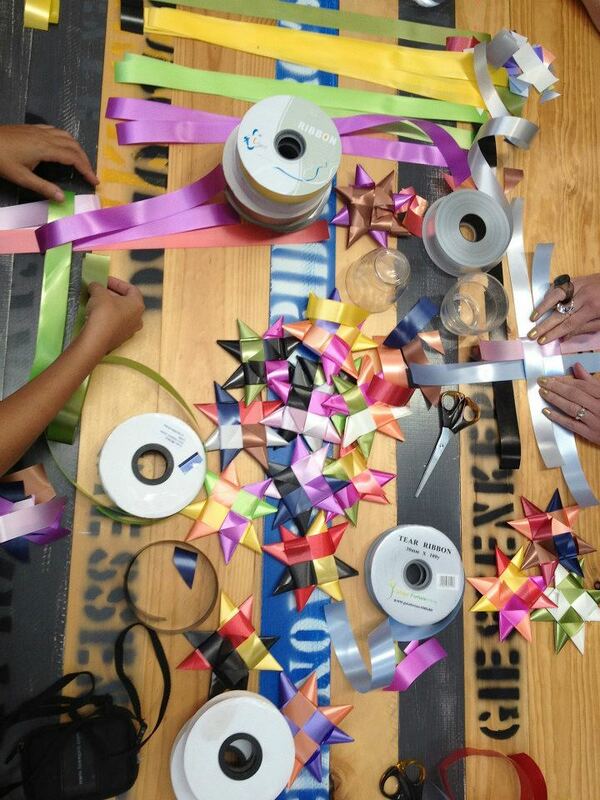 Where people are encouraged to come and make stars out of ribbon. These stars are symbolic of one’s support and declaration to choose to live in love and peace over violence. 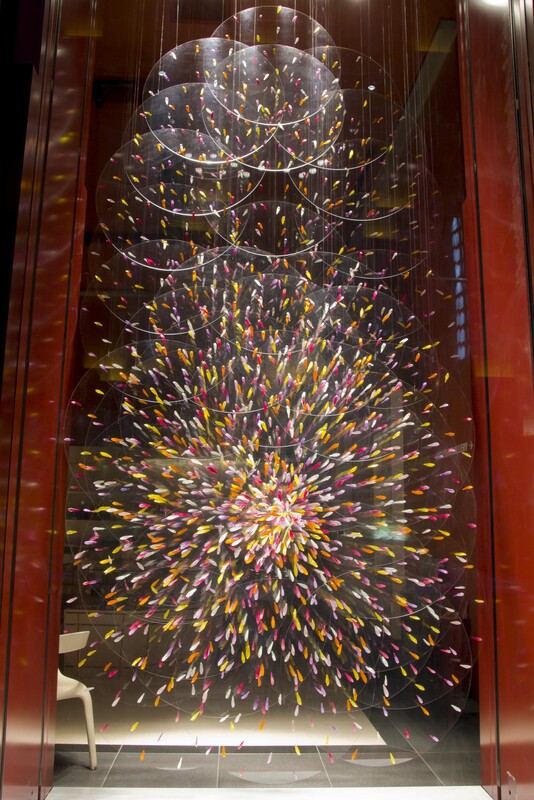 The stars made will then be used in a Myer Melbourne window installation for International Women’s Day. 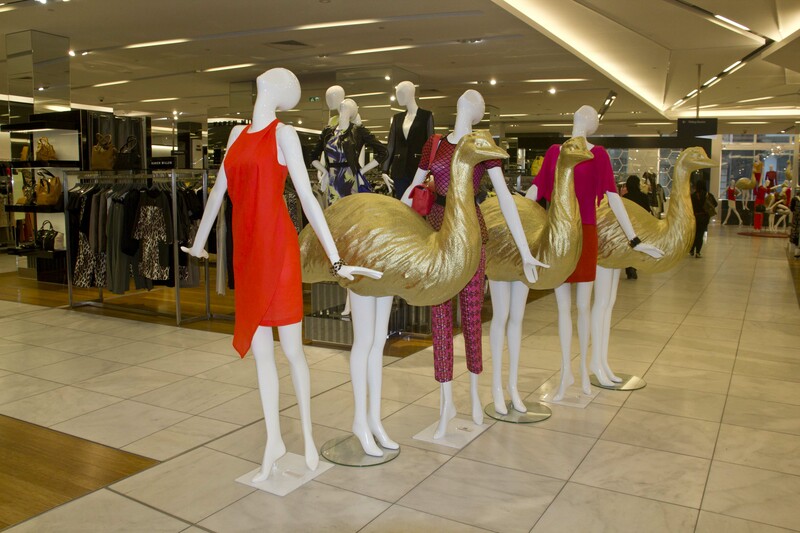 There will also be other installations that pop up around the Myer Melbourne in various locations in the lead up to the final window reveal on the 23rd of February, 2015. Over the past 5 months I have been working on the art direction for this collaboration and project coordinating all that needs to happen behind the scenes. Which has no doubt had it’s challenging moments, but has been a rewarding experience never the less. I have put my heart and soul into making this collaborative project happen and I hope that it will make a difference and an impact in the hearts of those who engage with this cause. In turn creating a greater awareness of this prevalent issue in our city, and beyond. I am proud to say that the project is set to launch this week! So please come on down, make a star and spread the word! Together we can be superstars and make a difference! 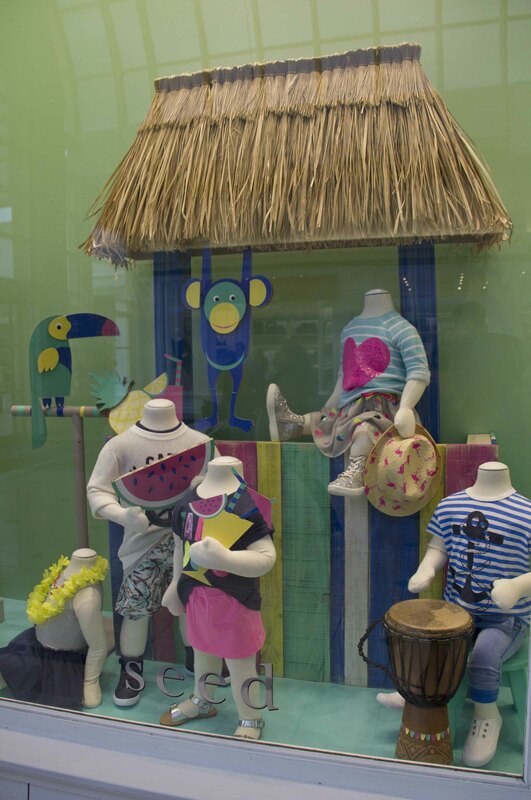 In my previous post on visual merchandising in Tokyo I covered windows and in‐store displays. 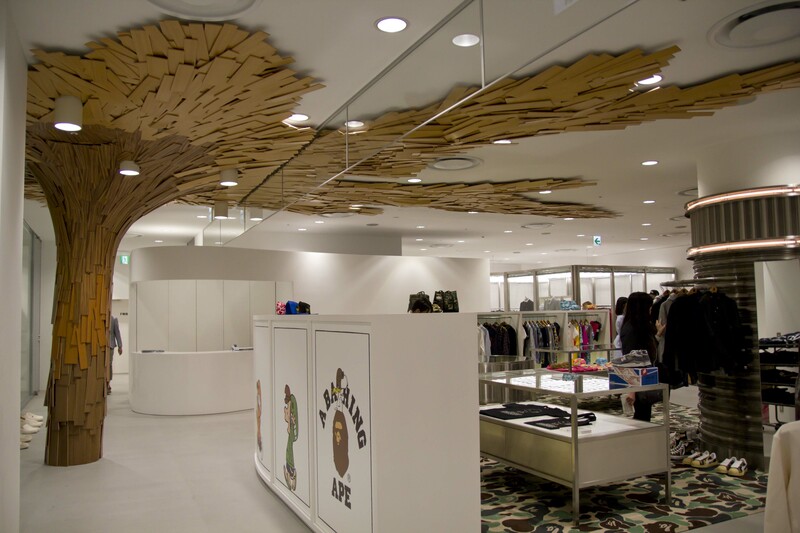 This post is a continuation of my last one and focuses mostly on store design in Tokyo. For those of you who haven’t had a chance to look at my last post on visual merchandising in Tokyo, please check it out here. The store design in Tokyo is nothing short of exceptional, I completely fell in love with Opening Ceremony, and Kate Spade. Dover St Markets was also a major highlight. 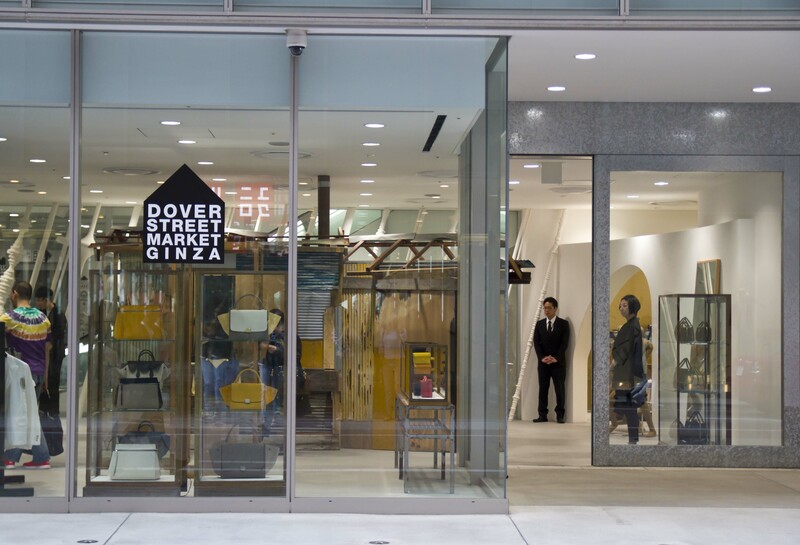 From my experience, when comparing the visual merchandising against the store design in Tokyo, I would say that the store design wins hands down. It feels like the Japanese use their store design to communicate their brand image more so than their window displays. It would be interesting to know whether one has a bigger impact on the consumer than the other, or whether they are relatively balanced in their levels of consumer influence? 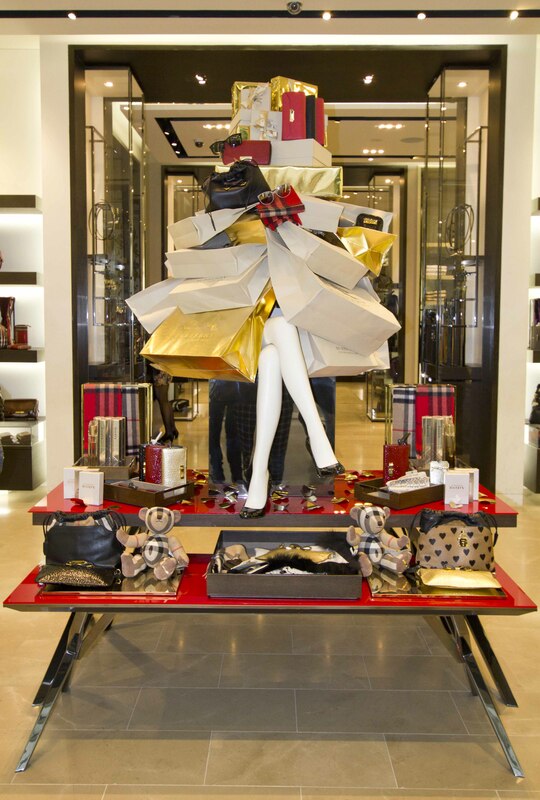 In saying that, obviously the best results would always be produced when store design and visual merchandising are working in conjunction with each other. But I wonder if they where separated, if a store only had one or the other, which one would prove to be more influential in a consumers decision to purchase? Practically impossible to measure I know, but the only reason I am pondering this is because I saw a lot of stores in Japan that where purely focused on store design with very minimal VM window and in store displays. But by all means take a look and compare for yourselves and let me know your thoughts? This is the no 1 must see if you are in Tokyo! The Dover st Markets is the epitome of fashion and design comprising of 6 levels of designer labels such as Comme des Garçons, Celine, Nike lab, Saint Laurent, Louis Vuitton, A Bathing Ape and much more. 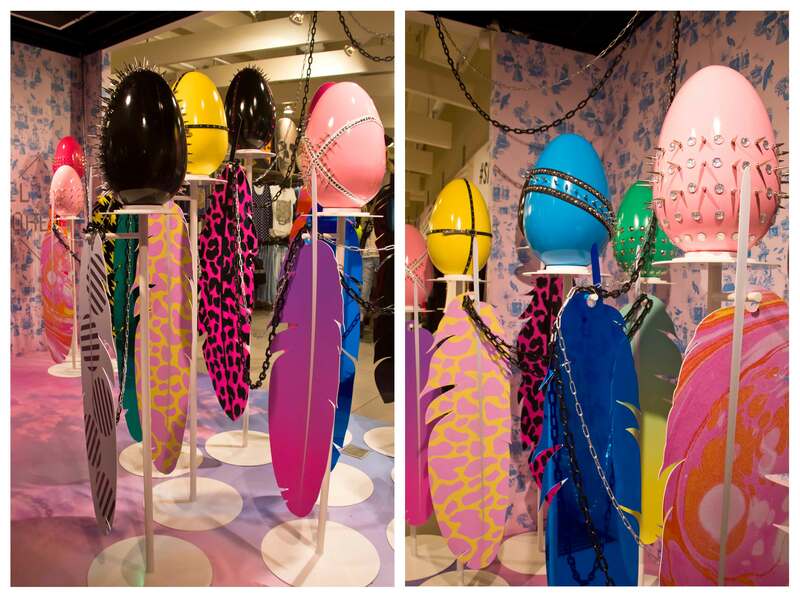 Opening Ceremony — Harajuku Innovation at its finest. Most inspiring place to shop hands down. Kate Spade — Aoyama Love, love, love this. And that dressing room is so good looking! Prada Flagship — Aoyama This store is divinely futuristic. Maison Martin Margiela Love the use of product in the grand piano, such a classy touch. Isetan Department store Most definitely the best department store in Tokyo. Alice in Wonderland cafe — Shibuya Also known as Alice in a dancing land cafe, this is a hidden gem, it’s an underground cafe, which you either stumble upon by falling down a rabbit hole or someone gives you some very specific directions as to where it is. However their are 6 individual alice cafes in Japan so you might just have some luck finding at least one of them. Recently I had the pleasure of participating in a visual merchandising trip to Tokyo. Tokyo is regarded as the one of top fashion capitals of the world with many avant‐garde designers in its midst. Tokyo is one of the few places in the world where fashion trends are taken to the extreme with the likes of harajuku and baby doll girls. It’s great, everywhere you turn you see a different fashion style, the Japanese add a whole new meaning to the word ‘unique’! They think outside the box and have impeccable design aesthetics. I would highly recommend Tokyo as a must see if your passionate about fashion and design. The best districts to visit for visual merchandising and store design would be Ginza, Harajuku, Aoyama, Shinjuku and Shibuya. Omotesandō st in Harajuku is where all the designer fashion flagships stores are located, much like the 5th ave of NYC. Architecture and store design here are not to be missed! Off this street are also many little side streets which are filled with heaps of little vintage and harajuku type fashion stores. The Harajuku district was definitely my favourite place to explore during the trip I went back there about 3 times! Check out some pictures from my trip here below. Most photo’s have been taken in Harajuku and Ginza districts. Ragtag The cutest floor directory board I have ever seen! 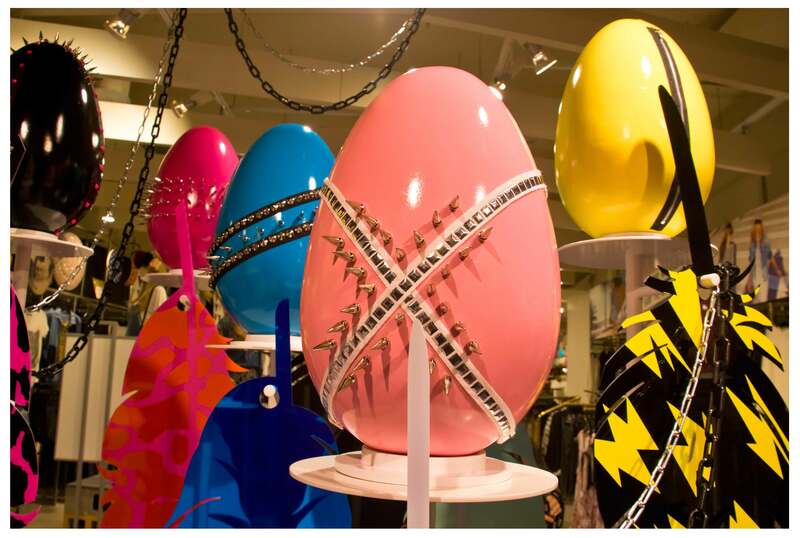 I have put together a selection of my favourite visual merchandising concepts from this Autumn/Winter season in Australia. Hope this gets your creative juices flowing! This is a foreign concept to many retailers but it’s exactly the way we need to be thinking, especially with the competition of online shopping these days. A giving retailer is a receiving retailer. May I indulge you all with a little Christmas eye candy from the Australian retail market. Check out this inspirational video I recently stumbled across. It’s an important message that all aspiring creatives need hear. 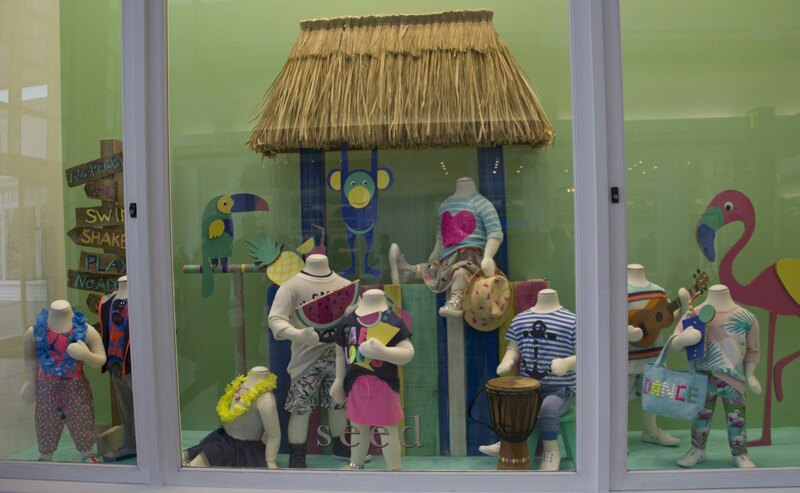 Here are (in my opinion) some of the top window displays from Australian retailers this spring/summer season. Enjoy! 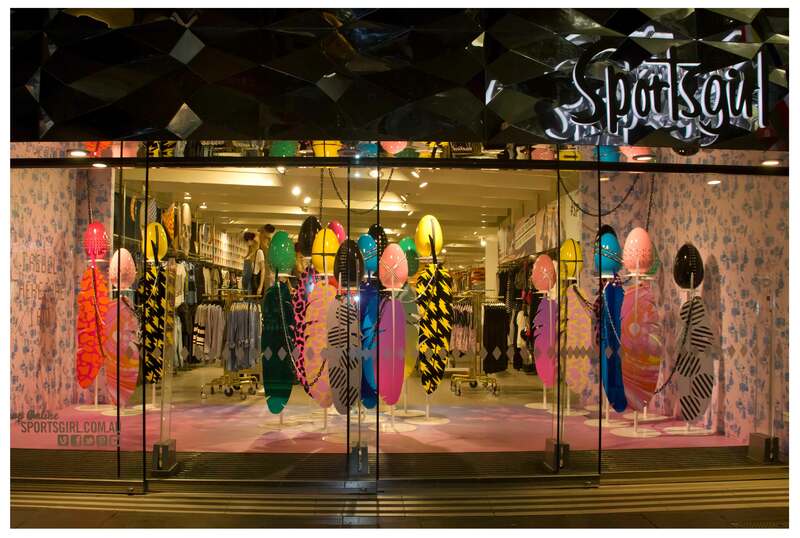 Recently I had the pleasure of working with Gloss Creative on a stunning installation for Sportsgirl’s Flagship store in Bourke St, Melbourne. 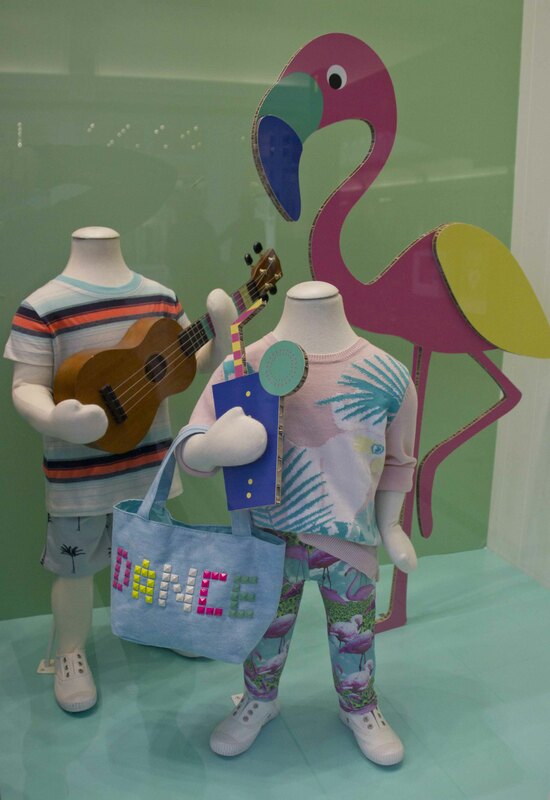 Spring/Summer has already come around again, and Australia’s leading department store, Myer has gone back to their Aussie roots this season, with the theme “This is Australia.” This theme is directed as a modern take on the natural elements of outback Australia. Take a look below for some ‘down to earth’ inspiration!